1.1" Color LCD, "Hold Image" or slide show modes, Stores up to 56 images, Rechargeable internal battery, Makes a great incentive gift or giveaway. 1.1" CSTN color LCD display Holds 56 digital images Built in rechargeable battery File format: BMP,JPG,PHG,GIF Still mode or automatic play Operating Systems: Win98 SE/ME/2000/XP. 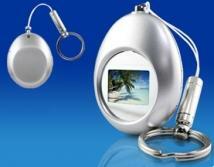 MOQ: 100 Accessories: Keychain, user's manual, software CD. Warranty: 1 year. Print Area: Front (Above LCD): 3/4"W x 3/8" L Back: 1 3/16"W x 1 5/8" L Materials & Finish: High Impact Plastic. 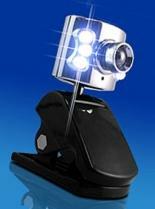 Cool Mini Webcam with built-in LED lights and adjustable-focus lense makes the perfect computer accessory. 1.3 Megapixel sensor High resolution color sensors Built-in light-sensing LED cam lights USB interface Mounting stand Automatic brightness adjustment Fully adjustable image settings WinXP/Win98/ME/2000. 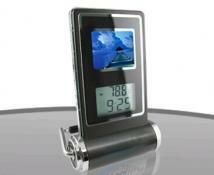 MOQ: 50 Accessories: CD with software, mounting clip. 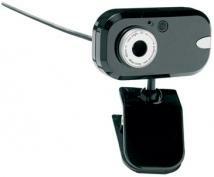 Body Colors: Chrome camera with black clamp. Warranty: 1 year Print Area: On clamp: 1 1/4H" x 1"W Materials & Finish: Metal and high impact plastic. 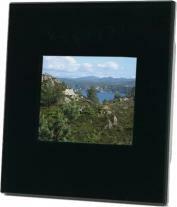 Memories are made of this... Pocketsize photo-frame with a 1.5" screen. 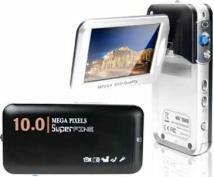 Keeps up to 50 images (2MB) close at hand wherever you are. Includes mini PDA too! Print Area: 1.50" x 0.50" Product Dimensions: 3.36" x 1.81"/screen 1.10" x 1.10" Packaging: Silver giftbox Packaging Dimensions: 5.10" x 0.10" x 5.10" Weight Product: 0.09lb Weight Product & Box: 0.31lb Compliance: CE, FCC, RoHS Features: Digital Photo viewer that lets you transfer up to 51 of your favorite photos from your computer Additional software included; Phone Book, To Do List, Shopping List, Calendar. Host Interface: USB 2.0 File Support: BMP, JPG Display: 1.5 inch CSTN LCD Resolution: 128 x 128 pixels Memory Size: 2 MB Photo Storage: Up to 51 photos Power Source: USB port or chargeable lithium battery (included). Accessories: Quick installation disc, user manual, USB cable. Enjoy a video conference wherever you are! Do more than just talk, turn a standard conversation into something special. Instantly add title and graphic effects in MSN or Yahoo Messenger etc. Print Area: .98" x .98" Product Dimensions: 2.40" x 2.60" x 1.87" Packaging: White giftbox Packaging Dimensions: 4.92" x 6.50" x 6.61" Weight Product: .14lb , including USB cable Weight Product & Box: .32lb Features: Instantly add title and graphic effects in MSN or Yahoo Messenger by using the supplied software package, the software processes your customized effects in real-time. Remote surveillance is also possible by using the special softwareBy utilizing the innovative MPEG-4 video, you only need Internet Explorer. Host Interface: USB 1.1, USB cable included (length 59.06"). System Requirements: CPU: Pentium III 800MHz or above / 128MB RAM. Support: Windows 98 SE / ME / XP / 2000 & MAC OS9 / OSX. Sensor: 1/4 CMOS Sensor" Effective Pixels: 1.3 Mega Pixels (interpolated) Resolution: Max. 1280 x 1024 (SXGA) Color Depth: RGB24 / 1420 Frame Rate: Max. 30 fps (640 x 480: 30 fps, 1280 x 1024: 15 fps). Lens View Ange (Degree): 53 0 Default Focus Range: .15" to infinity Auto Exposure (Ae): Auto (also auto white balance) Sound: Built-in microphone Clipper Width: .20" x .98" Working Temperature: 5 - 40 Celcius degrees Working Humidity: 20% - 80% Rating Voltage: 5V Rating Power Consumption: 1090mW Rating Input Current: 218mA Accessories: Driver CD, USB cable and instruction manual. 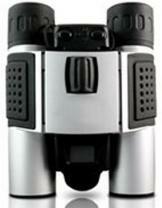 Digital Camera Binoculars with built-in 300,000 pixel digital camera, Great for sports and recreation gifts. Quality metal body with rubber comfort grips. LCD status display shows picture count, picture settings. Holds over 75 images(VGA) or 300+ images (QVGA). Connect to your PC to record video. Includes PhotoImpression photo editing software. Auto power-off feature saves batteries. 10x25 power binoculars. MOQ: 200 Accessories: neck strap, CD and user manual. Warranty: 1 year. Print Area: On the barrels: 1 1/4"W x 3/8"H On top of unit aligned with barrels (2 possible locations): 1 5/8"W x 3/8"H Materials & Finish: metal,rubber and high impact plastic. 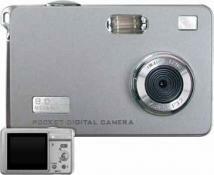 The new CDS-18 digital camera is the perfect party camera for your company party, student gift, or gift set item. 1.3 MP sensor. Holds up to 102 pictures. MOQ: 100 Accessories: Generic Box with Graphic, Wrist strap, User Guide, CD with drivers and photo editor software, USB connector cable. Body Colors: Silver with blue and orange faceplates. Warranty: 1 year. Print Area: Front, left of lense: 3/4"W x 1"H Back: 1"W x 1"H Materials & Finish: High Impact Plastic. Your favorite pictures wherever you are! Folding digital photo album, ideal to travel, includes calendar, clock and, temperature indication, Always keep your favorite pictures close at hand. Print Area: Front: 1.97" x 1.75" / inside: 0.8" x 0.3" Product Dimensions: 2.36" x 2.36" / screen: 1.10" x 1.10" Packaging: Giftbox Weight Product: .24lb Weight Product & Box: .35lb Compliance: CE, RoHS Features: 1.5" display. 1 MB memory (stores up to 60 pictures). auto play function. digital calendar. alarm clock (with snooze alarm). measures temperature. Host Interface: USB 2.0 File Support: BMP, JPG, GIF Resolution: 128 x 128 pixels Accessories: User manual, CD-rom driver, USB Cable. Your favorite images in style on your desk! Ideal for a desktop promotion, stores up to 25 photos with built-in, rechargeable battery, Supplied with 3 different colored interchangeable frames. Print Area: Front: 2.75" x 0.75" Product Dimensions: 3.35" x 3.35" / screen: 1.97" x 1.50" Packaging: White giftbox Weight Product: .11lb Weight Product & Box: .16lb Compliance: CE, FCC, RoHS Features: 2.4" TFT LCD. Supplied with 3 different coloured interchangeable frames. Rechargeable lithium battery for 3 hours playing. Built-in memory for 25 images storage. Slide show function. Neat little stand, stored behind the frame. Supported Picture Formats: JPG, BMP, GIF, TIF, PNG. Resolution: 320 x 240 pixels Operating System: Windows 98/2000/ME/XP/Vista Accessories: USB cable, application software CD, instruction manual. Audio and Video Player! 2.4" LCD Viewer 2MP Digital Camera Plays and Records Video Photo Album Games FM Radio Voice Recorder Built-in Rechargeable Battery. MOQ: 100 Accessories: Head Phones, User Guide, Battery charger and Software CD Materials & Finish: ABS Plastic & Aluminum. 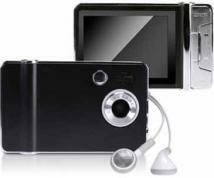 Touch Screen Audio and Video Player! 2.8" LCD Viewer 2MP Digital Camera Plays and Records Video Photo Album Games FM Radio Voice Recorder Built-in Rechargeable Battery. MOQ: 100 Accessories: Head Phones, User Guide, Battery charger and Software CD Materials & Finish: ABS Plastic & Aluminum. Share your memories with a touch of class! Stunning design and large print area make for a true touch of promotional, class... 7" digital photo screen with touch sensitive display, shows either, photos or videos and plays MP3 music. Print Area: 7.48" x .98" Product Dimensions: 8.62" x 5.87" x .79" (6.10" x 3.43" for screen). Packaging: Silver giftbox Packaging Dimensions: .98" x 7.28" x 2.36" Weight Product: .95lb Weight Product & Box: 1.54lb Compliance: CE, FCC, RoHS Features: Touch sensitive keypad design. Slideshow function for JPG photos. Optional remote control. Speakers: Built-in stereo speakers (2 x 1W) Host Interface: USB 2.0 File Support: MP3, MPEG1, VCD1.0, VCD1.1, VCD2.0, SVCD, MPEG2, MPEG4, AVI, DAT, DIV, XVID, DIVX (supports the following versions of XVID: XVID 1.00, 1.02, 1.03, 1.10-beta1, 1.10-beta2 and the follow versions of DIVX: all, except 3.11 and 6.0). Supported Picture Formats: JPG Maximum Megapixels: 1,0 Horizontal Viewing Angle: 60° Clarity: 300 : 1 Cd/M: 200 nits Compatability: Compatible with MS, SD and MMC cards, supports USB disk. Display: 7 inch LED with TFT Resolution: 18.90" x 9.21" Resolution Showing Area: 6.10" x 3.39" Power Source: AC-DC adaptor (AC 110~230V) (DC 12V1A) Audio: Audio line out Video: Video line out Menu Languages: English, German, French, Portugese and Italian. Extra Software: Calendar Accessories: Audio line out cable, Video line out cable, bracket, AC/DC adaptor, user manual. 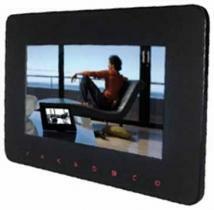 The best view you can imagine... 9" digital photo-frame with unique retractable keypad operation, plays, photos, videos and MP3 music. Print Area: 2.75" x 1" Product Dimensions: 10.67" x 7.44" / screen: 7.87" x 3.94" Packaging: White giftbox with sleeve Weight Product: Inquire after options Weight Product & Box: Inquire after options Compliance: CE, FCC, RoHS Features: Plays photos, music and videos. Slide out control panel design. Read MS, SD, MMC, XD, CF and USB device. Included clock and calendar. Zoom-in function. Slideshow function. Rotate function to view the photos at different angles. Host Interface: USB 2.0 File Support: JPG, MP3, MPEG1, MPEG2, MPEG4, DIVX, AVI Resolution: 640 x 3 (RGB) x 220 pixels Internal Flash Memory: Optional: 128MB Accessories: USB cable, AC adaptor, user manual. Screen size:10.4 inch digital TFT LCD(4:3) Resolution: 640 x 480(we use SHARP digital TFT) Memory: Compatible with SD /MS/MMC/CF/XD and usbdrives. File format: Compatible with AVI/MJPEG1, MPEG4, Motion-JPEG, MP3?JPEG etc. 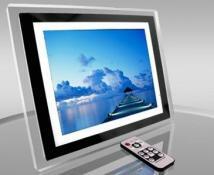 A/V format Additional features: MP3 Music background set up; shows 9 pictures at one time photo lantern slide play. Optional Built-in memory: From 128MB -1 GB Remote control: Infrared remote control Zoom : YES and also display panorama; auto-circulate pictures VGA output: NO Regulatory Certification: FCC / CE / RoHS Product dimension: W 11.625 x H 9.125 x D 2.25 inch Weight : 2 LB Box dimension: 14.2 x 12 x 3.54 inch. 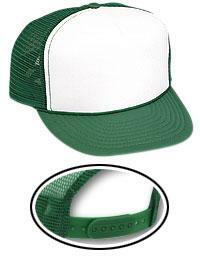 Warranty: 1 year Body Colors: Black or white border; clear acrylic outer frame. Print Area: Top Center: 5"W x 3/8"W MOQ: 100 Accessories : AC Adapter, user manual, full function remote control. Materials & Finish: High Impact Plastic.